The purpose of this Sample Question Set is to provide you with information about the Dell EMC VPLEX Specialist for Implementation Engineers exam. These sample questions will make you very familiar with both the type and the difficulty level of the questions on the E20-260 certification test. To get familiar with real exam environment, we suggest you try our Sample Dell EMC VPLEX Specialist Certification Practice Exam. This sample practice exam gives you the feeling of reality and is a clue to the questions asked in the actual Dell EMC Certified Specialist - Implementation Engineer - VPLEX (DECS-IE) certification exam. These sample questions are simple and basic questions that represent likeness to the real Dell EMC E20-260 exam questions. To assess your readiness and performance with real time scenario based questions, we suggest you prepare with our Premium Dell EMC VPLEX Specialist Certification Practice Exam. When you solve real time scenario based questions practically, you come across many difficulties that give you an opportunity to improve. 01. Which data mobility operation leaves the storage volume unclaimed? 02. You are preparing to migrate the topology of an installed VPLEX Local system. What is a supported upgrade path? 03. When creating logging and metadata volumes, which LUN requirement applies to both volumes? a) Array LUNs must be zeroed-out. c) Array LUNs must be thin. 04. What is a group of VPLEX directors that participate in the cache coherence protocol for a virtual volume? 05. Where is the wwn-seed physically located on VS2 engines? 06. In which directory is a session log file created whenever the Management Console is launched? 07. Which volumes should be placed in Storage View for a RecoverPoint cluster? 08. You have added a new storage array into VPLEX, but it does not see it. Which VPLEX command will display the new storage array? 09. Do virtual volumes need to be taken off-line prior to upgrading VPLEX software, and why or why not? 10. What is the purpose of VPLEX Witness in a Metro environment? 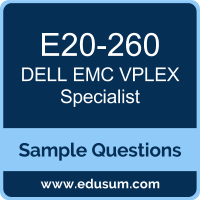 Note: For any error in Dell EMC Certified Specialist - Implementation Engineer - VPLEX (DECS-IE) (E20-260) certification exam sample questions, please update us by writing an email on feedback@edusum.com.